Проект за доброволци в частно (Rudolf Steiner) училище в Грац (областен град). Начало на проекта : 1ви март 2019. Грац е много красиво студентско градче, пълно с млади хора и много живот през цялата година. Проекта е много актуален. Организацията ми писаха вчера, че все още си търсят доброволец/ка. Private School is looking for 1 (one) Volunteer from EU 28 program countries as well as from Liechtenstein, Norway and Iceland from 1st of March 2019 to 28th of February 2020 (12 months). The Freie Waldorfschule Graz was founded by parents and teachers more than 35 years ago and is part of the worldwide Waldorf/Steiner-School association founded by Rudolf Steiner in 1919. 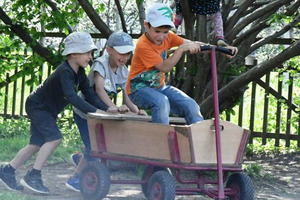 FWS Graz is a general education comprehensive school with about 300 pupils and covers classes 1 to 12, making it one of the bigger Waldorf schools in Austria. There are 45 teachers, most working part-time. A kindergarten and a nursery are also located on site. The actual Waldorf curriculum (2010) is based on the principles of Steiner´s pedagogical guidelines. It gives equal attention to the physical, emotional, intellectual, cultural and spiritual needs of each pupil and is designed to work in harmony with the different phases of the child’s development. Main focus is laid on artistic lessons like music, art, drama theatre and craft based subjects as stone- and woodwork, tailoring, forging, weaving etc. This kind of education enables students to think and act independently with great interest in progress and development of culture and society. There are buildings for different workshops and a huge garden for growing vegetables and also for playing on the property. As an answer to the refugee crisis the association Sekem and the FWS-Graz established an international class in 2016 for unaccompanied minor refugees to offer them education and transmit cultural values. The volunteer will have the opportunity to help students during the lessons, in the workshops, with projects, sports and in the afternoon care. These tasks will give him/her a good insight of what is Waldorf Pedagogy like and in the best case his/her upcoming ideas, suggestions and hints could be integrated into our work. We would like to support a young person in his/her personal development and give him/her new ideas for the future.